Hi everyone! I’m Jen from Yummy Healthy Easy. I’m married to a hunky husband and am the mom of four crazy boys, who are always hungry. 🙂 Since I’m a busy mom, I like to make and blog about meals that are quick, easy and (mostly) healthy with the occasional treat thrown in. I can’t even tell you how excited I am to be here today! I love The Recipe Critic and am always inspired by Alyssa’s recipes and photography. Thanks for having me! So, like I said, four boys. They eat me out of house and home (as my mom likes to say). But they are my built-in taste-testers, which I guess is a good thing, right? Who else would eat all the stuff I make?! Anyway, my oldest, who’s a big bad 6th grader now, loves breakfasts. Pancakes are his ultimate favorite thing in the whole entire world. If I announce that it’s breakfast for dinner, he seriously does a happy dance. I usually end up making a big breakfast a couple times a week, mostly for him. These pancakes are one of his favorites and a fall breakfast staple in our house. Put simply, they are amazing. They’re fluffy, filling and delicious. The pumpkin makes them moist but isn’t overwhelming. It’s just the perfect amount of pumpkin. 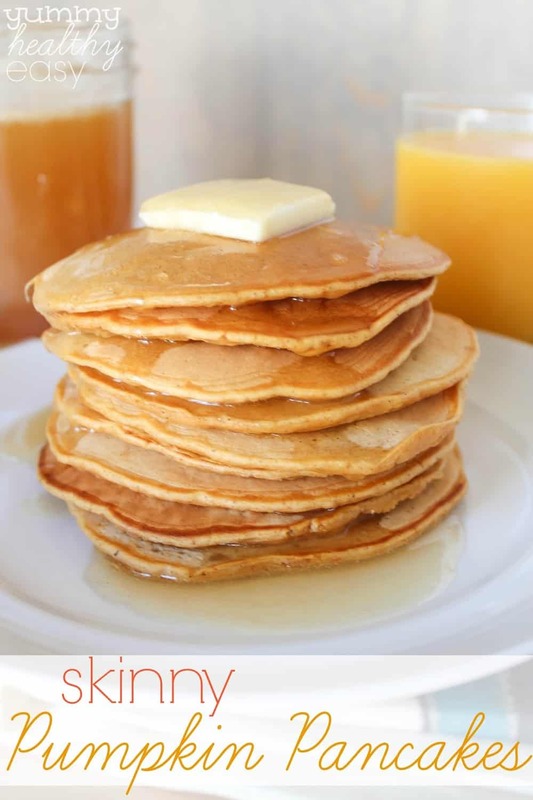 Of course the fact that these are “skinny” means you can go right ahead and slather them with butter and syrup! 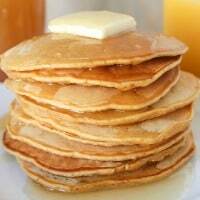 😉 I hope you give these pancakes a try and then come visit me over at Yummy Healthy Easy for some more delicious recipes. See ya soon! 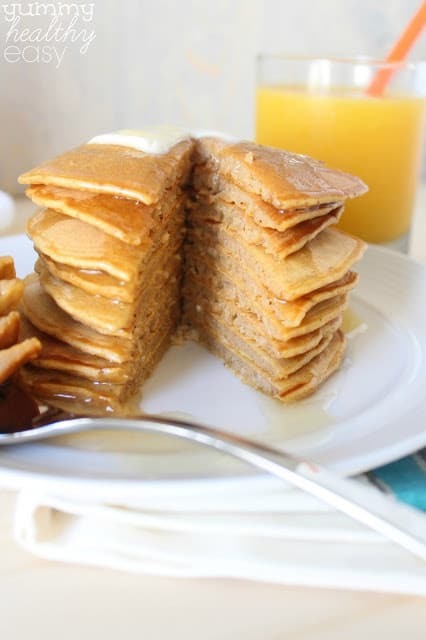 Delicious Pumpkin Pancakes made with healthier ingredients! Heat griddle or skillet on medium heat and spray with cooking spray. 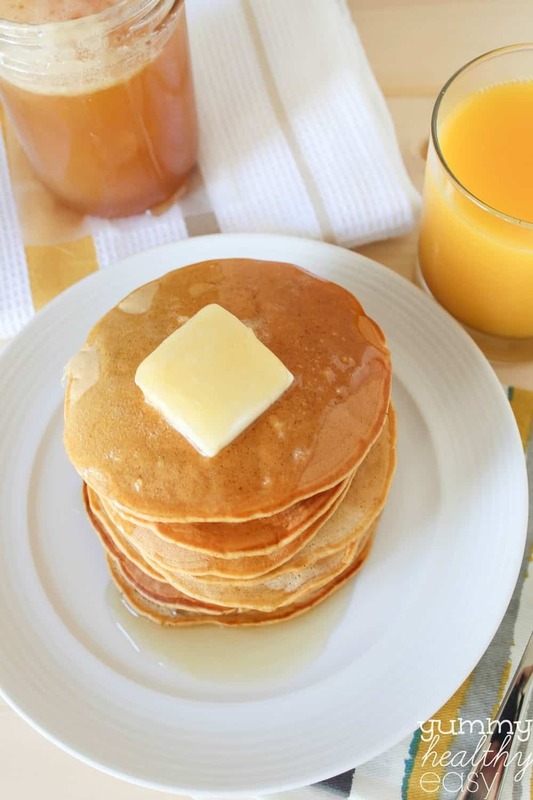 Pour batter onto heated griddle or skillet using a ¼ cup measuring cup. Flip when bubbles appear at the top. 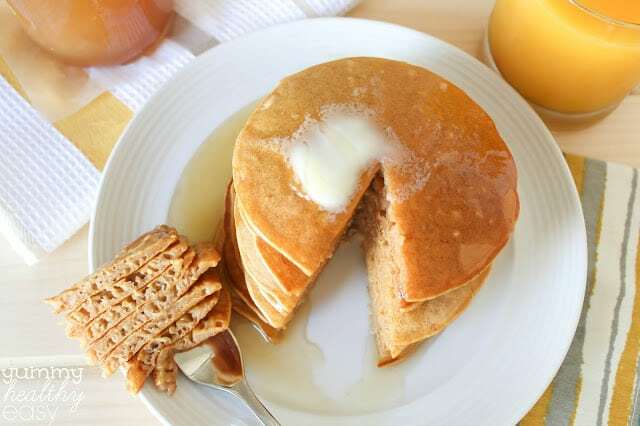 Serve with buttermilk syrup and enjoy! I saw these yumminess and pinned it…but had to visit to check out.. Nice recipe. Serve with buttermilk syrup? What? I love anything pumpkin and these sound delish! They are so yummy Debbie! I hope you’ll give them a try! Would love to know how many this recipe serves? Hi Paula! It makes about 16 pancakes but it really depends on how much milk you add to thin out the batter. I’ll usually add a little more than the 1-1/2 cups of milk and so I can end up with anywhere from 16 to 20 pancakes. Thanks for the question! I hope you enjoy them! Can i use fresh pumpkin instead of canned pumpkin? Thank you! I’ve personally never used fresh pumpkin in this recipe, but you should be able to use fresh pumpkin as long as it’s pureed and still only 1/2 cup! Thanks for the question! I am making these right now… had a nibble……for quality control of course. They are fantastic and sooo easy! Thanks for the recipe! YAY!!! I’m thrilled you liked them Ashley!! hearing. Either way, great blog and I look forward to seeing it expand over time.